At Rug Doctor we are about your carpet! With the Mighty Pro X3 Pet Pack, you will have everything you will need to keep your home clean. This pack includes the industry leading Rug Doctor Mighty Pro X3 deep cleaner which renews and refreshes carpet. With single-pass cleaning and multi-directional fiber brushes, the X3 out performs competitors by spraying, scrubbing, and extracting stains and dirt from carpet. The X3 Pet Pack also includes 2 Rug Doctor Professional Pet Formulas. Use the Pet Formula Solution in your Mighty Pro X3 to deep clean and remove tough pet stains. This formula deodorizes carpet from the foul odors left by pets. For a quick clean, the Rug Doctor Platinum Urine Eliminator Spray uses a pro-enzymatic formula to extract pet stains and neutralize foul smells. This spray refreshes carpet and leaves it soft and clean. Both solutions contain a pro-enzymatic formula that deters your pets from re-marking. 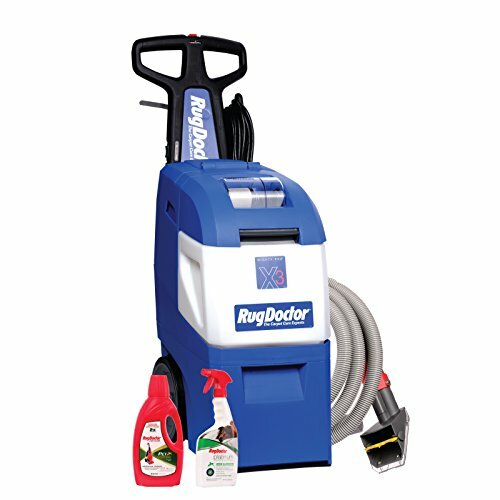 Cleaning your home is easy and effective with the Rug Doctor Mighty Pro X3 Pet Pack! Handheld Upholstery Tool cleans stairs, cars, furniture, tight spaces and more! Platinum Urine Eliminator Spray provides an effective, quick clean on new and old pet stains. View More In Floor Cleaning Machines. If you have any questions about this product by Rug Doctor, contact us by completing and submitting the form below. If you are looking for a specif part number, please include it with your message. Onyx Propane High-Speed Floor Buffer/Burnisher 21"